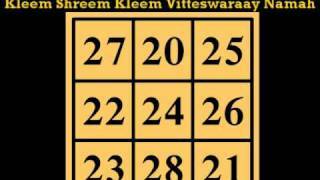 NeWs YoU CaN UsE: video: "Kubera Money Mantra (God of Wealth)"
video: "Kubera Money Mantra (God of Wealth)"
Dedicated to Kakolee for requesting it. Lord Kuber (or Kubera or Kuvera) is believed to be the lord of riches and wealth in Hinduism. Kuber Sadhana is considered a great way of pleasing the lord to bestow one with wealth and fortune. Kuber is many a times called the treasurer of gods. If pleased with you the lord opens avenues of wealth and riches for believers. Lord Kuber is also believes to be the head of the Yakshas (savage beings). The Yakshas are both human and demon and are responsible for the security of the treasures hidden beneath the earth of the great mountain Himalayas. Kubera Yantra is used as a tool to attract the cosmic wealth energy, accumulation of riches, increase cash flow at home, etc. It opens up street for new sources of income. Worship of Kuber Yantra is also suggested for excellent growth in business, career and profession and increase in personal income and abundance. The specially of this Yantra is their No. 72 should come by winning the Number from any side the joint on of 72 Total 9. For realization of Lord Kubera, massive monetary gain, wealth, fortune and all round success. I recommend at least one mala (108 reps) of this mantra each day. You can also chant his beej (seed/root) mantra "Dhham" (some use "Sam"). Recite it as much as you can till the problem is solved (like ajapa -ceaseless mental repetition throughout the day). For worshiping him you have to sit facing North Director. You can use a Rudraksha mala as he is a follower of Shiva or a White Crystal Mala to chant his nama.